Our website is free to our classmates without advertising. We do this by paying an annual subscription fee to our webhost. Please support our site with an annual donation of $3.00 or more (please disregard the buttons asking for $75 or more as that is not necessary)! Click the Donate button below to make your donation by PayPal, or with a regular credit card if you do not have a PayPal account. Thank you. EARLY BIRD TICKETS NOW ON SALE!!! If you see someone using the site, you can now LIVE CHAT with them including video chat. See link on left side of home page. You will need the latest Flash Player to use this function. On Apple computers you can use the IM feature through a Firefox web browser. 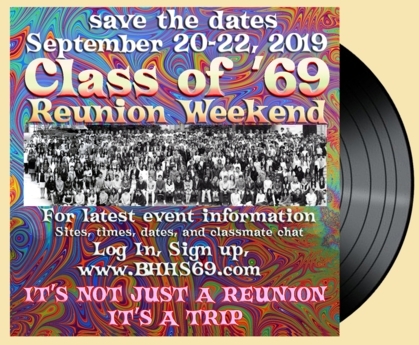 WELCOME TO THE BHHS CLASS OF '69 WEBSITE. If this is your first time to the site, please register by clicking the JOIN HERE link on the right side of this page. On the next page enter the same system password we gave you for our old website in the box labeled New Classmates and Guests. (If you need us to send you the system password again, just click the Contact Us tab at the top of the home page and we will send it to you.) Then click the button that says continue on to the next page. When you see the class list, click on your name and fill out your contact info, create a new personal password, establish your privacy options, upload more photos and provide the information to create your profile on the following few pages. Once you have registered and we verify your registration, thereafter you need only log in with your email address and your personal password to access all areas of the site. To classmates who have already registered, you may simply log in on the right side of the home page with your email address and the password you created when you registered. WHAT A NIGHT....WHAT A WEEKEND WE HAD AT OUR 40TH REUNION, OUR 45TH REUNION AND THE INFORMAL REUNIONS AT ROXBURY PARK OVER THE LAST FEW YEARS. Thanks to all who participated. And a special thanks to each and every member of the committee who worked so hard to make it a truly enjoyable and memorable time. Our 50th reunion is right around the corner. So stay active in our new site and by all means, have fun!!! Remember to make a donation to help us pay for this fun new website. Click the DONATE button on the right side of the home page and follow the instructions. Please tell us how you like the new website. We also have lots of room for more music and photos to share. We need the ER, HM and Hawthorne folks to help set up their Then & Now photos. Click the Contact Us tab and give us your feedback. Thanks from your Administrators.